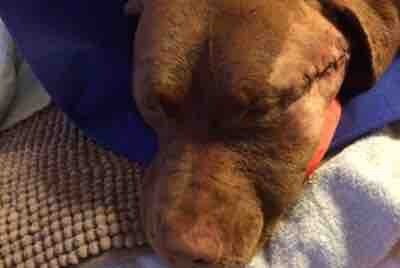 Ginger, a rescue dog was shot in the head by a neighbor after she dug a hole under our common fence. I think she wanted to go play with their dog. The neighbor claims Ginger charged him so he shot her in the face. She had gone over there twice before so he was ready and waiting for her to come again. A Maricopa Country Sheriff found her walking down my dirt road bleeding profusely and looking for help. She found an angel dressed in a MCSO uniform. He scooped her up and took her to the best vet in town. Im not sure if he had the sirens going or not! After Ginger was assessed, we realized her medical bills would be at least $3000 - $4000. Unfortunently, I dont have this kind of money. If I did, I would not hesitate one moment to treat her immediately. The office asked me to please don't put Ginger down. Then a Christmas miracle happened right then; this fine officer said her would par fpe Ginger's medical bill. Who does that?!! It is my Christmas wish that with the help of all animal lovers around the world, I can pay this Deputy back. Any remaining funds will go toward law enforcement charities, animal rescues and future rescue dogs that are always coming through my rotating door. Of course the officer will be involved in choosing these charities! All of us at The Miller Mutt Motel and Sanctuary sincerely thank you for your love and support. We wish you the Merriest of Christmas and a Happy New Year! Ginger is progressing nicely. She got her stitches out last week and everything looks good. Other good news; she doesn't seem to have any real issues from the gunshot. Her sweet personality is as sweet as ever. I will be looking at the list of potential adopters this weekend. Please let me know if you are interested in adopting her. It will be difficult to give her up but we all know it what needs to be done. A big huge sincere thank you to everyone who donated. The concern and compassion for all of us was and still is heartfelt to NO end. I have not yet been able to repay and thank Deputy Bowling (the Sheriff who saved Ginger twice!). He has been busy with the holidays and work. Between you and I, he is a bit reluctant to accept the gratitude and money coming his way. I look forward to a sweet reunion with him! Again, a million hugs and thanks to ALL of you. I'm so moved by people I've never met and all the people that are in my everyday life. What a true blessing you are. I don't know how to properly thank all of you!! Ginger and all of us at the "Miller Mutt Motel and Sanctuary" love you all!! Thank you a million times over to everybody that has shown love and interest for Ginger and more importantly, Sheriff Bowling. Ginger continues to recover nicely. Yesterday she started walking around the house more and showing more interest in eating. She is so sweet as usual. I apologize for for not posting updates. I have been swamped. The money left after paying back Deputy Bowling will be donated to various charities, with the approval and suggestion of the Deputy. It fills my heart to see such generosity, I wish you all a very Merry Christmas and the Happiest of Holidays. Wow, nothing better to do than complain about someone's spelling. This was a story about a compassionate sherriff, a single woman who kindly takes in foster dogs and couldn't afford to pay vet bills, not a story input blame. Maybe you need to find a little Christmas spirit Mr. Grinch! Adam Miller somewhat is a compound word. Please get it right. Hey, Adam Miller. You might want to check your own post before talking smack about someone else's ... A dog "wondered" into your camp? Doubtful. Adam Miller, Wandered, not wondered. I made a small donation and wouldn't mind you using it to modify your fence so the dogs can't get out, especially when you have a neighbor like that. If someone knows the name and/or address of this neighbor, please post or send to me. Thanks! The original goal was 2500.00, when i donated. Why is it going up, every time I check? I hope someday the neighbor gets what he deserves. What comes around, goes around. He is a moron for doing this, but someday, hopefully soon, will get his pay pack and then wonder why things dont go his way. AGAIN, i hope he reads this ... YOU ARE AN A**SHOLE!!! Plain and simple!!! Im glad the dog is ok and I donated $20, i hope the dog finds a good home. Going back there she will only dig a hole and go back into the yard again. She needs to be away from that idiot of a neighbor that has NO compassion. Feel sorry for whoever is around him. Hey Adam Miller... take a deep look at yourself. I think there is more there to worry about then someone else's spelling or their use of grammar! You MISSED the entire point of this amazing story! A dog's life was saved by a selfless woman who takes in homeless animals. Then, because of the extreme kindness of an angel in a blue uniform, this dear, sweet dog's life was once again saved!! Doesn't get any better then that!! Get a life Mr. Miller! Now, here's to all the Christmas Angels out there who stop to notice those who need them the most! God Bless You! Amanda Bebak Lawler, I know I should not keep inappropriate and irrelevant posts alive, but I am SO in a zone of frustration over so many 'wrongs' that no one wants to make right. Maybe you didn't read Adam Miller's post before admonishing a person pointing out an error in it; Mr. Miller was actually the original 'Grinch.' The irony is that Mr. Miller began his post with, 'Sorry to be cruel, but the least you could do is show you are some what educated and spell words correctly,' when, in fact, his post is full of all manner of errors: spelling, punctuation, use of incorrect words - not to mention wordiness and poor sentence structure. The remainder of his post is the recounting of a personal incident that prefaces a mild admonishment to the original poster to keep her dog more securely enclosed. Maybe that is sound advice, but it is difficult to swallow when administered by 'the pot calling the kettle black,' if you catch the meaning. Bravo everyone! Bravo for caring!! Why has the goal gone from 2500.00, when i donated, to 5500.00? Sorry to be cruel, but the least you could do is show you are some what educated and spell words correctly. I am happy that the puppy didn't have to be put down and that the shooter pretty much missed his shot. I am a gun owner and was out camping a few weeks ago with my family and both of our dogs. Our dogs were leashes and someone pulled in after us and just let their dog out. Needless to say I pulled my sidearm on their dog because it wondered into our camp three different times after we had asked them to chain up their dog before one of ours attacked it. The other camper saw me pull my sidearm and immediately responded, got his dog and put it on a leash. You shouldn't have to chain your dog in your yard however, maybe you should have a block wall installed or maybe you should keep the dog inside especially considering your dog has done this before. Good luck! How is she doing? Did she get adopted out yet? What charges if any did this a hole get that shot the dog. Hayley post the guys address who did this so others know where to find this guy. He deserves what he gets for doing this. Oh yes his priceless backyard was so more important than that of a dog's life. What a complete moron. He is a dog owner himself...that's a worry. Hayley, YOU are an amazing person taking in foster dogs like you do...Deputy Sheriff Bowling is AMAZING for thinking outside the box and doing what was in his heart! Ginger is beautiful and I am so happy to hear she is recovering nicely. You are so right...there are not too many people who would have done what Deputy Sheriff Brian Bowling did. It's soooo COOL how this ALL happened...even though there is the shocking negative part regarding your neighbor...there is a REALLY GOOD PART of this story that shows the AWESOMENESS of HUMANITY!! The BEST to Ginger and all of the beautiful people who gave $$ to pay back Deputy Sheriff Brian Bowling! Bless You for your kindness and paying it all forward! God Bless and keep safe this hero police officer.